If July 31st wasn’t my daughter’s first birthday, I would make my way to Colori in Chicago’s Bucktown neighborhood. 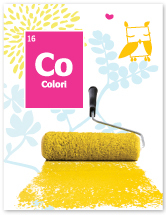 Colori is an eco paint boutique and on July 31st they are hosting an all day, hands-on workshop focusing on creating beautiful green play spaces for kids. I have used Mythic paint, a brand of eco-paint they sell, and it is wonderful. It has no VOCs, is very durable and is competitively priced. I honestly can’t think of a good reason NOT to use this paint. Michelle Quaranta is the owner of Colori Eco Paint Boutique and is a color therapist/consultant. Friends and I have relied on her eye for color and have been thrilled with the results. She can consult with you right in the store or can make a house call to really help to refine your color vision. Really, if you’re going to make an investment in paint for a room or entire house, shouldn’t it be right? !